Tropical storms and cyclones have been around as long the world has had weather, but giving them human names is a 20th century development. Ships, on the other hand, have been getting names for centuries. In the summer of 1875, a nameless storm off the lower Texas coast battered a vessel with a famous name. She was the Texas Ranger, a coastwise steamboat. Despite the two tough-sounding words painted on her stern and the best efforts of her captain and crew, the riverboat could not withstand the forces of nature. Even so, she had a long career before the end came. Her story begins in May 1851, when a group of cotton planters and businessmen agreed they needed a dependable vessel to operate on the Brazos River between Washington-on-the-Brazos and the large waterfall at Sullivan’s Bluff near Port Sullivan in present Robertson County. The capitalists subscribed money to buy a new side-wheeled steam packet from a New Albany, IN shipbuilder. What they got for their funds was a vessel of 159 tons burthern, 136.5 feet long and 22.3 at the beam. She drew 5.5 feet of water. For a year or so, the Texas Ranger operated on the Brazos, carrying cotton, passengers and freight. Though considered navigable, the Brazos was not Mississippi. Like most Texas streams, it had more water in the spring than summer, but navigating the stream was never particularly easy, at least compared with other, larger rivers. Once she cleared the Brazos, the Texas Ranger’s usual destination was Galveston and then on to New Orleans. On Dec. 8, 1853, Texas Ranger master William Stockman and other steamboat captains operating vessels out of New Orleans signed an agreement regulating passenger fare and freight tariffs along with procedures for the handling and transport of freight from Louisiana to the upper Red River and its tributaries. A year later, the Texas Ranger had begun operating out of Shreveport, moving people and goods to Port Caddo, Texas and back. Stockman, who had part ownership of the Texas Ranger, sold her in 1853 to the U.S. Quartermaster Department. More than likely, the Army used her to carry supplies from New Orleans to Indianola on the mid-Texas coast. Five years later, William E. Starke of New Orleans bought her from the government. After then, the Texas Ranger had several owners before going into Confederate service in 1861 at the beginning of the Civil War. Following the war, back in civilian ownership, she operated along the Gulf coast. In 1875, on course from Vera Cruz, Mexico toward the United States, the Texas Ranger steamed straight into the maw of an approaching tropical storm. Soundly built, she must have put up a good fight. But she foundered on a sand bar off Brazos Santiago within sight of the lighthouse at Point (now Port) Isabel. Towering waves beat her to pieces and sank her on June 25, 1875. 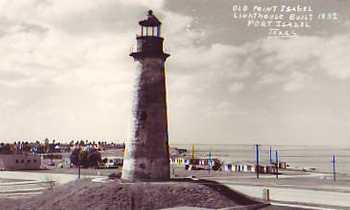 "Old Point Isabel Lighthouse Built 1852, Port Isabel, Texas"
Nine crewmembers went down with the ship. The captain floated to shore on a piece of debris but soon died, making the death toll 10. Only two crew members survived. Four years earlier, Congress had created the U.S. Lifesaving Service, forerunner of the U.S. Coast Guard. Unfortunately for the crew of the Texas Ranger, most of the service’s stations existed along the more populated East Coast and along the Great Lake. But the same year the Texas Ranger wrecked, Washington approved funding for five life saving stations in Texas, including one at Brazos Santiago. However, government being government, the station did not open until 1879 – four years too late for the last crew of the Texas Ranger. The 1875 storm that ruined the Texas Ranger was not even the worst storm of the season that year. On Sept. 16, 1875, what scientists now believe was a Category 4 hurricane ravaged Indianola. In addition to the human loss in the wreck of the Texas Ranger, a reported $200,000 worth of gold and silver -- in bars and coins – was lost with the ship. Not calculating collector’s value or the price of gold or silver by the ounce, $200,000 would be worth $3,897,406 in 2007 dollars simply by virtue of inflation. Neither the wreckage of the vessel nor its treasure has been found – at least by anyone who will admit it.